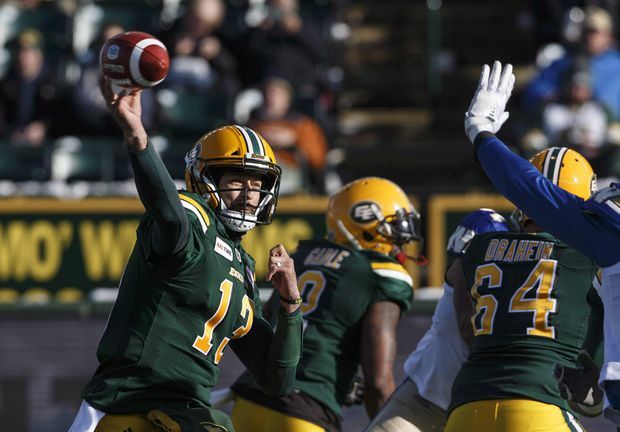 Edmonton Eskimos quarterback Mike Reilly makes the pass against the Winnipeg Blue Bombers, in Edmonton, Alta., on Nov. 3, 2018. It was $5.2-million in 2018, but the league and its players must still negotiate this year’s figure. The current collective bargaining agreement expires in May. Shortly after Reilly’s deal, Harris signed a two-year contract with Edmonton reportedly worth $1.1-million. The 32-year-old established career highs with Ottawa last year in pass attempts (615), completions (431) and yards (5,116), then had a playoff-record six TD strikes in the East Division final before the Redblacks lost 27-16 to the Calgary Stampeders in the Grey Cup. When asked if his deal was worth just under $3-million (there were reports of $2.8-million) for four years, Mitchell said, “If math serves correctly, that’s correct. While he lost the most coveted player, Edmonton GM Brock Sunderland was a big winner Tuesday. Shortly after Reilly’s official departure, Sunderland went on the offensive, adding Harris, receiver Greg Ellingson and offensive lineman SirVincent Rogers, all previously with the Redblacks, and Daniels. Lions GM Ed Hervey also was busy Tuesday, adding Canadian offensive lineman Sukh Chungh, who spent the previous four seasons with Winnipeg, Durant – the top Canadian in last year’s Grey Cup – and former Edmonton defensive back Aaron Grymes. The Roughriders signed former B.C. linebacker DyShawn Davis on a one-year deal.